Want to convert your file names from all upper case to all lower case? Or vice versa? Oftentimes, programs create default file names that are all uppercase or all lowercase, which might not be what you want. It's easiest to organize your files when they are all in the same case, which is where Recase comes in. Recase is probably one of the simplest programs out there for helping you manage your file names. 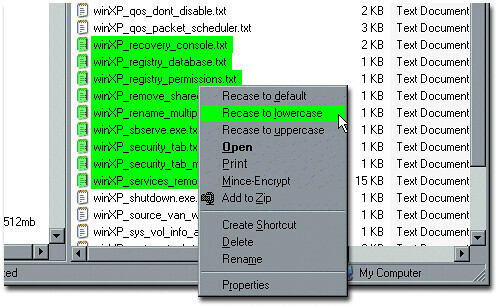 After you install Recase, you can access its functions directly from the right-click context menu. Highlight a group of files, then right-click on them, and select one of the options (default, uppercase, and lowercase) to change the case of the file names to what you desire.